Showing you that I'm not just a nerd for economic data, I'm a nerd for all data, here are two items from opposite sides of the geological spectrum. First, fire: Hawaii's Kilauea volcano is one of the most awesome things I've ever seen. For years, it was spewing lava that ran in tubes down to the ocean - that is, until early March of this year, when fissures briefly opened up on the side of the volcano and the lava stopped. This completely drained the crater, called Pu'u O'o, from which it had erupted. Lava has continued to fill the entire crater to the rim, and has begun to spill out. Here is the link to the webcam at the side of the crater. Next, ice (or really, the lack thereof): Here is the most recent daily map of ice in the arctic ocean. This week, as you can see, the artic sea lane north of Asia is completely ice free. Ships can sail from the Atlantic Ocean east of Greenland, north of Russia, and through the Bering Strait to the Pacific Ocean, without ever encountering ice. The "Northwest Passage" through the islands north of Canada, has not opened - yet. Without doubt, the rear view mirror news of a steep reduction in first Quarter GDP to a puny +0.4%, and the below expectations +1.3% 2nd quarter GDP, was the biggest item of the week. 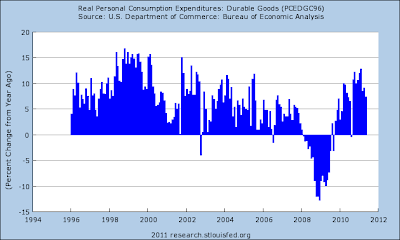 Durable goods and consumer confidence also fell - and durable goods had been expected to increase. Both of these are components of the LEI. Meanwhile the Case Shiller index was mixed, with month over month increases, but a deepening decrease in the March - May period. And then there is the utter lunacy in Washington, still continuing as I write this Saturday morning. Oil finished at $95.70 a barrel on Friday. Gas at the pump rose another $.02 to $3.70 a gallon. Gasoline usage at 8999 M gallons was -6.6% lower than last year's 9632. This is the fifth week in a row that gasoline usage has been significantly less than last year, and the worst weekly comparison yet. Further, with the exception of 3 weeks, this comparison has been negative YoY since the week of March 12. With few exceptions, all this year Oil has been at or above the level of 4% of GDP which according to Oil analyst Steve Kopits is the point at which a recession has been triggered in the past. Indeed, the most recent decline in gasoline usage - similar to the decline in the last few months of 2007 - viewed alone must be viewed as flashing a full recession alarm. Retail sales, however, tell a completely different story. The ICSC reported that same store sales for the week of July 23 increased 4.2% YoY, and increased 0.3% week over week. Shoppertrak reported a 4.3% YoY increase for the week ending July 23 and a WoW increase of 2.8%. This is the fifth week in a row of a strong rebound for the ICSC, joined for the second week by Shoppertrak. The American Association of Railroads reported that total carloads increased 1.1% YoY, up 5800 carloads to 524,100 YoY for the week ending July 23. Intermodal traffic (a proxy for imports and exports) was up 1800 carloads, or 0.8% YoY. The remaining baseline plus cyclical traffic was up 3900 carloads, or +1.4 YoY%. This series has rebounded after going negative two weeks ago. Railfax graciously gave me their breakdown of baseline vs. cyclical carloads, which shows that baseline traffic was down 6104 carloads, or -3.3%YoY, while cyclical traffic was up 11,858 carloads, or +11.9% YoY. As I pointed out last week, Professor James Hamilton of UC San Diego showed Oil shock recessions are triggered by overcompensating cuts in spending by consumers. In contrast, this year consumers appear to have instead cut back on gasoline in order to increase other retail purchases. Rail traffic likewise indicates a stall, but not a contraction at this point. The BLS reported Initial jobless claims under 400,000 for the first time in 3 months last week, at 398,000. The four week average decreased to 413,750. Jobless claims are on the verge of breaking out to the downside from their recent range of 410,000 - 430,000. The American Staffing Association Index rose 4 points to 88. The ASA indicates that this is a typical rebound from the prior July 4 holiday week decrease. This trend of this series for the year remains worse than 2007, but slightly better than the early recession of 2008. Adjusting +1.07% due to the 2011 tax compromise, the Daily Treasury Statement showed that withholding taxes collected for the first 18 days of July 2011 totaled $124.6 B vs. $116.8 B a year ago, for an increase of $7.8 B. For the last 20 days, $135.0 B was collected vs. $126.4 B a year ago, for an increase of $8.6 B, or 6.8%. In the past month, this comparison has improved considerably compared with its May - June stall. Since these series all completely stalled in May and June, this two week rebound is welcome. The Mortgage Bankers' Association reported that seasonally adjusted mortgage applications decreased -3.4% last week. For the 8th time in 9 weeks, however, the YoY comparison in purchase mortgages was positive, up 2.2% YoY. Refinancing also decreased -5.5% w/w. The last 9 weeks have shown the best YoY comparisons since late 2007. YoY weekly median asking house prices from 54 metropolitan areas at Housing Tracker showed that the asking prices declined -4.2% YoY. The areas with double-digit YoY% declines decreased by one to 8. The areas with YoY% increases in price increased by one to 8. This continues the record of improving YoY comparisons in this series. We are at the point of maximum economic impact due to the abrupt 100,000 decrease in housing starts in spring 2010. The above two series indicate relative improvement going in to 2012. M1 remained even w/w, but was up 2.4% m/m, and up 14.6% YoY, so Real M1 was up 11.2%. M2 was up 0.4% w/w, up 2.2% m/m, and up 7.8% YoY, so Real M2 was up 4.4%. Both M1 and M2 have surged in the last 4 weeks. Real M2 is now solidly in the green zone above +2.5%, meaning that both money supply indicators are bullish. On the other hand, weekly BAA commercial bond rates increased .04% to 5.75%. Yields on 10 year treasury bonds decreased .03% to 2.97%. This continues to indicate slowly increasing deflationary fears, and a slight increase in relative distress in the corporate market. My old German grandmother used to have a saying which translates as "those who cannot see must feel." There is nothing in the high frequency data telling us that we are tipping over into a double-dip recession at this time, although very weak growth just above a stall has been evident for several months. But the economy is very vulnerable to a shock, as durable goods orders and plummeting consumer confidence show. Washington seems determined to provide that shock. America has been unable to see, and so it looks inevitable that shortly it will begin to feel. There is little to do by way of economic analysis this week, because everything depends on the timing and extent of Washington idiocy. (1) this is all Kabuki and ultimately rational actors will prevail. Wrong. If this were just kabuki, it would have ended as soon as Wall Street called their servants in Washington and told them to make a deal. Instead, already we are paying a price in the markets and with the ratings agencies - who are likely to downgrade US debt even if a deal does emerge over the weekend. As Calculated Risk concedes this morning, "it is already impacting the markets." It does not matter that we can easily pay our debts, if there is a sufficiently powerful faction able to block those payments and willfully default. This may sound churlish at such a moment, but in addition to blaming the recklessness of today’s Republican party, the man who deserves substantial blame for this impending economic doomsday is Barack Obama. For two and a half years, he has been all but training the Republicans, Pavlov fashion, to keep rejecting compromise. He has done this by rewarding them with a treat every time they up the ante or move the goal posts. [. . ] if the Republicans, like Europe’s leaders of 1914, miscalculate and create disaster, the responsibility will partly be theirs but also partly our overly eager-to-please president. In other words, Obama may have the intellect of John Quincy Adams, and the soaring rhetoric of JFK or Reagan, but he has the economic instincts of Herbert Hoover, and the negotiating skill of Jimmy Carter. Imagine if the Tea Party gets their capitulation now, and the world is saved from US default next week. They will pay no price with the public, who will believe that at the last moment, all became well again. Imagine what the budget "negotiations" will be like, let alone if the debt ceiling must be raised again before January 20, 2013. There is no good solution now, only the hope that once "those who cannot see, must feel," a cold and fearsome resolution will seize the electorate. Real gross domestic product -- the output of goods and services produced by labor and property located in the United States -- increased at an annual rate of 1.3 percent in the second quarter of 2011, (that is, from the first quarter to the second quarter), according to the "advance" estimate released by the Bureau of Economic Analysis. In the first quarter, real GDP increased 0.4 percent. Let's stop right there. First quarter GDP was originally reported at 1.8%, which has now been revised down by over 1.5%. That's a huge revision and indicates the first quarter was a period of near contraction. 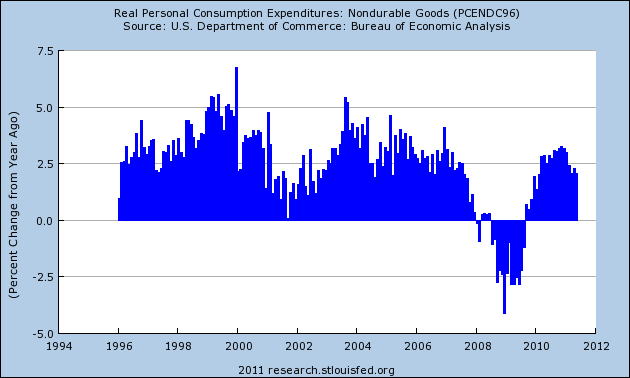 Real personal consumption expenditures increased 0.1 percent in the second quarter, compared with an increase of 2.1 percent in the first. Durable goods decreased 4.4 percent, in contrast to an increase of 11.7 percent. Nondurable goods increased 0.1 percent, compared with an increase of 1.6 percent. Services increased 0.8 percent, the same increase as in the first. The consumer has pretty much dropped out of the economic picture, pulling in his spending in reaction to the slow macro and employment environment. That means 70% of the economy is no longer participating, which is a huge problem. Most importantly, the 4.4% drop in durable goods purchases indicates the consumer is deeply concerned about the future and is avoiding long-term financial commitments. The durable goods data point also explains the sharp cancellation in exisitng home sales contracts in the latest report. Real nonresidential fixed investment increased 6.3 percent in the second quarter, compared with an increase of 2.1 percent in the first. Nonresidential structures increased 8.1 percent, in contrast to a decrease of 14.3 percent. Equipment and software increased 5.7 percent, compared with an increase of 8.7 percent. Real residential fixed investment increased 3.8 percent, in contrast to a decrease of 2.4 percent. Real federal government consumption expenditures and gross investment increased 2.2 percent in the second quarter, in contrast to a decrease of 9.4 percent in the first. National defense increased 7.3 percent, in contrast to a decrease of 12.6 percent. Nondefense decreased 7.3 percent, compared with a decrease of 2.7 percent. Real state and local government consumption expenditures and gross investment decreased 3.4 percent, the same decrease as in the first. The drop in government spending is probably a big contributor to the drop in first quarter GDP (consider that a hint to Washington which will go completely unheeded). This report stinks all around; there is no good news contained therein. The economy was near stall speed in the first quarter and is barely moving forward in the second. Ideally, we'd see the dollar in a relief rally sometime over the next week or so to provide confirmation of the downside break-out. This is when I'd go short. The dollar has been consolidating in a triangle pattern for the last few months. Last week, it broke to the downside. The ideal trade in this situation is to wait until the chart retests key technical levels and then trade in the direction of the break-out move. In practical terms, that means to wait until the index rallies into previous resistance, and then go short. Last week, the vast majority of the price action occurred around the 21.10, 21.15 level. Prices dropped to the 20.90 level on Wednesday in reaction to the debt ceiling debate and poor economic numbers, but then rallied on Thursday and Friday, returning to the week's previous levels. 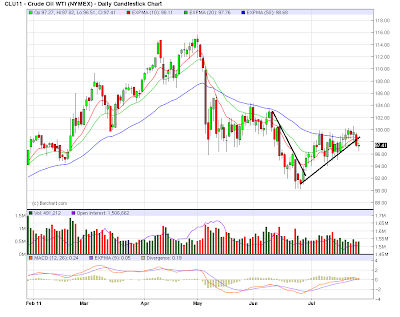 The daily chart shows prices have rallied into previous support. Also note the now bearish orientation of the EMAs -- the shorter are below the longer and all are moving lower. Prices have now found resistance at these levels. Also note the strength of the upward bars on the chart. The dollar is being pulled from two distinct directions right now. On one hand, the debt debate and weak economic numbers are adding downward pressure to the index. On the other hand, the dollar is still considered a safe haven in times of distress. While we focus on our little legislative drama, remember that the EU situation continues to add further stress to the world's economies, thereby creating a bid for the dollar. Both academic economists like Prof. Brad DeLong, and lay observers have voiced skepticism, even "alarm," that economic indicators developed from post-WW2 inflationary recessions, usually brought about by Fed tightening, are applicable to deflationary scenarios brought about by asset and credit contraction like the present. In response to that, for over a month I have been testing publicly available economic data series that go back to the 1920s at least. But did the founder of ECRI, and the father of modern business cycle research, Prof. Geoffrey Moore, leave behind no public record, in particular a record discussing Leading Indicators for pre-WW2 recessions? It turns out he did, in the form of a very thorough 1961 manuscript, available from the NBER via the St. Louis Fed, in which he identified and discussed Leading Indicators from the pre-WW2 period (as to some of which data went all the way back to 1854) and tested them to see if they applied to the post war recessions of the late 1940s and 1950s. They did. The meat of his discussion is found in Chapter 3 of the manuscript, from which the following quotes are taken. Before the war, in 1937, Wesley Mitchell and Arthur Burns picked a set of twenty-one indicators from among the several hundred time series that the National Bureau had analyzed in its study of business cycles. [NDD note: Mitchell and Burns' 1937 manuscript is here] After the war I undertook to redo the job and in 1950 published a new list of twenty-one indicators. They are classified in three groups— leading, roughly coincident, and lagging—according to their tendencyto reach cyclical turns ahead of, at about the same time as, or later than business cycle peaks and troughs. Many of the series in my list were either identical with or closely related to those in Mitchell's and Burns' list, but I omitted some that seemed redundant or of dubious value, and added some on the basis of new information. But both their study and mine were based on prewar information about the cyclical behavior of the data. The experimental part of the project consists in seeing whether this prewar information provided a useful guide to the postwar behavior of these data in relation to business cycles. Prof. Moore categorizes the themes of the data series that proved useful as Leading Indicators as follows: (1) sensitive employment and unemployment indicators - in particular, hiring and firing in manufacturing, (2) commitments to new investment, (3) business profits and failures, and (4) inventory investment and industrial commodity prices. He found that, as to the comparison of the postwar [WW2] with the indicators selected on the basis of prewar records did show that "What is significant, and encouraging, is the fact that the postwar record is substantially the same as the prewar record." Note that 4 of the leading indicators from the pre-WW2 era -- housing starts, stock prices, new orders for durable goods, and the manufacturing workweek -- are still on the list of 10 LEI's today. This should give us a great deal of confidence that what they show now is as valid as what they showed in the last 100 years and beyond. When I was trying to figure out if there was a housing bubble or not, the academic economists I had come to trust said no, the fundamentals explain this. Sometimes this was backed by econometric analysis. But many people outside of academics, or at least a few, said there was a bubble. This was often backed by logic, intuition, and simple charts rather than sophisticated econometrics based upon theoretical constructs. For the most part, I dismissed the people I should have listened to, especially if it contradicted what the academics were saying. Most of all, I relied too much on the experts in the academic community instead of listening to all the evidence and then thinking for myself. One of the reasons I didn't listen is that until I started blogging, I was pretty arrogant about academic economists. As far as I was concerned, pretty much, academic economists knew more about everything related to economics than anyone else. But one thing I've learned from the wide array of voices in the blogosphere is that I was wrong. Academic economists have a lot to learn if they are willing to listen. I thought I would weigh in with some thoughts. I remember one of my first economics classes where a professor was talking about consumers and how they plan for inflation. 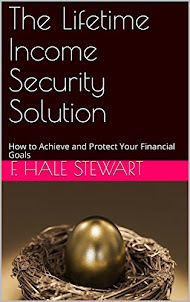 She argued that consumers wake up every day trying to figure out what the inflation rate would be. I disagreed, saying this is not a conversation many people have on a regular basis. She responded by saying I thought that people were stupid, thus ending the conversation. What she was arguing was that all people are rational -- a basis of the Chicago school of economic thought. I felt then -- and still argue to this day -- that this is a faulty premise on many levels. Hence, I believe that any model based on this theory is inherently wrong and should be completely ignored. This leads to my two basic problems with most academic economists. The first is the use of models to predict behavior and economic performance. The US economy is over $14 trillion dollars in size with over 300 million people spread out over an incredibly diverse and wide ranging geography that has literally millions of different cultural biases and preferences. There is no way you can model that. Period. To argue that you can model that is folly. Second, the basic assumption that people are rational and make all of their decisions rationally. No. That does not happen at all. We are not Vulcans, we are humans with a tremendous amount of emotional complexity that prevents purely logical decision making. To argue we are rational is to ignore reality. And to base an entire discipline on that assumption is the height of arrogance or stupidity (or a combination of both). In short, I think a fair amount of academic economists are stuck in a theoretical world that has absolutely no bearing on reality. They remind me an awful lot of law professors who write articles on incredibly bizarre topics that get published in law reviews to be read by other academics who then write more obtuse responses. This creates a great, self-perpetuating cycle of more and more ridicules research that has no use to the everyday legal practitioner. What I do look for are economists who utilize relevant information. A great example is David Rosenberg, who use to be with Merrill Lynch and is now with Gluskin Sheff in Canada. He uses all sorts of information to derive his conclusions. Mark Zandi at Moody's is another good example, or Paul Kasriel at Northern Trust or Dr. Ed Yardeni or the folks at the Liscio report. I should also add that a fair amount of economic blogs fall into this camp, which makes them that much more relevant. All of these people look at data, compare it to other relevant data and try to figure out what is going on. As such, a lot of these people wound up being right about the housing bubble, the recession and a whole lot more. And in case you're wonder -- this is the type of analysis we try and do here at the Bonddad Blog -- look at the data to see what is happening and figure out where things might be going. The primary difference that I see between the academic world and the real world economists is the difference in the use of their information. Academic economists seem to be interested in writing for their own little bubble world of other academic economists while the real world economists are trying to create "actionable information" to determine where to allocate money. As such, the academics seem pretty irrelevant to those of us in the real world. Give the fundamental supply/demand situation, I still expect prices to be moving higher. But right now, we're seeing the standard issues of prices moving through a large number of technical resistance levels on their move higher, which is to be expected given the chart. 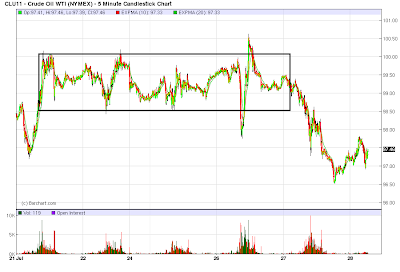 The above chart shows that prices consolidated between 99 and 100, but then sold off yesterday. Prices were in a rally and did move through the EMAs. However, notice the candles over the last few days -- the days when prices were above the EMAs -- were weak, indicating there was little demand pulling prices higher. Also note the strength of yesterday's bar moving lower, which was quite strong. Finally, the MACD is about to give a sell signal. Yesterday, all speculative commodities took a hit as the markets started to seriously consider the possibility of a US default. Right now, this trumps the overall supply and demand situation. Should a default occur, expect prices to move lower, as a default will slow economic growth and thereby lower overall demand. However, if a default is avoided, expect the upward trajectory to continue. After thinking about NDDs position yesterday, I want to go on record as saying I agree with him. A situation that should have gone off without a hitch has now demonstrated the US Congress is an utter joke, completely unable to govern: The debt ceiling debate should have been a non-starter -- a simple voice vote in the House where everybody realized voting for the increase was in the nation's financial self-interest. Instead, we've seen the most ridicules ideas rise to the top of the political debate. There is no leadership: Boehner has no control over the Tea Party Wing and Reid has little real power. Pelosi -- who does seem to have more control over the more liberal house elements -- has been left out of negotiations. Obama has become more adept at using the bully pulpit, but doesn't seem to have the nuanced negotiating skills necessary for intricate negotiations. As such, there is no figure who can ram something through at the last minute. There is no acknowledgement of the real problem: when was the last time anyone in Washington talked about unemployment? 'Nuff said. There is no talk of a real solution: if you want to balance the budget, you have to talk about tax increases. The gap between revenues and expenditures is simply too large to consider any other option. And yet, those are off the table -- despite the fact the overall tax burden is the lowest it's been in nearly 50 years. This is amazingly stupid. I have called the culture in Washington the "Washington Lobotomy Factory" for a reason: there is no mention of logic or facts; instead, everything is pure politics. No one wants to solve a problem; everyone wants to score political points, and nothing more. As such, let them bear the fruit of their actions -- or in-actions. Shut the government down from sheer stupidity. Let the economy take a hit and contract for at least a quarter and probably two. And then vote all of these idiots out of office. I love the smell of stupidity in the morning. It smells like .... Washington. Today, I want to take a look at copper, as this chart is giving me hope for the next few months. First, note that from the beginning of February to roughly the end of June, copper was in a downward sloping pennant pattern, eventually finding support around the 200 day EMA -- the line the generally separates bull and bear markets. Since than, copper has rallied. The above chart shows that copper prices jumped through resistance and from the 200 day EMA, quickly making strong gains over about a week of time. During this rally, prices printes some very strong bars on very impressive volume. 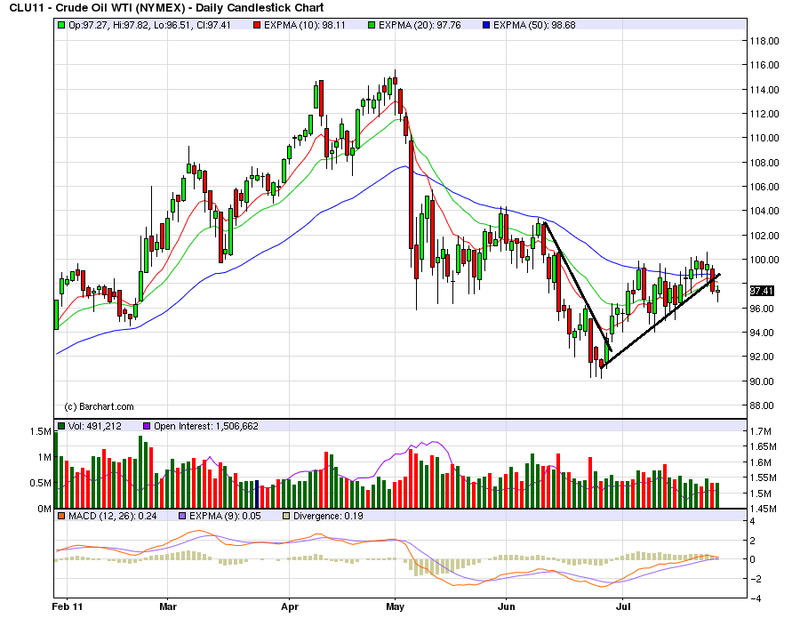 Since the, prices have consolidated sideways, using the 10 day EMA as technical support. Volume has dropped off, but we've not seen an accompanying drop in prices. The EMAs are becoming bullishly aligned. The A/D line does not show an outflow, but the CMF is lower. Most importantly, the MACD has just given a sell signal. This chart gives me a bit of hope, as copper is a good leading indicator. However, this is one of the only charts lately that shows any sign of anticipated economic expansion. "Diejenigen, die nicht sehen können, müssen sich fühlen." Translation: "Those who cannot see, must feel." Additionally, Housing Tracker's updates continue to show that inventory is also declining. In short, as the distortions abate in the YoY comparisons, I expect Case Shiller to join Housing Tracker (which is current through last week) in reporting "less worse" declines. A further, heretical, thought on the debt debate: Bring on the Default! I just wanted to add a brief, and totally out of the box, comment to Bonddad's last post. Allowing the US to default, even temporarily, on its debts, would have horrible reverberations to our, and the world's economy, possibly sending us right back into economic contraction, and would increase the interest on all of our debts for years to come. Making cuts to Social Security and Medicare, and imposing a strait-jacket of fiscal austerity, would have horrible reverberations for our economy and the welfare of 90% of our citizens, would undoubtedly only be the first course in the Grand Banquet of cuts to the safety net, and would cause misery and privation that would last for decades to come. In short, at this point, as horrible as the disease is, the posited cure is even worse. Given the choice, bring on the default, and we the voters will fix things in 2012. P.S. : Let me just add that I agree with the first Anonymous below. A "clean" bill or even abolishing the debt limit entirely is the best choice. My comment above speaks to the abysmal choices that are actually being debated in Versailles. P.P.S. : Prof. Krugman makes a similar point. 1.) Of all the debates we could be going through at this point, this is the dumbest possible. The last two employment reports have been terrible prints, consumer spending is slowing and manufacturing is also showing weakness. All that leaves is government spending to help the economy along. And now we're going to slow that down, too. 3.) The current state of the Republican party shows the long-term effects of living in a hermetically sealed world of right wing radio and Fox news: you become dumber than a post. After these yahoos get their decreased spending, they're going to wonder why GDP prints negative for at least one quarter and probably more. 4.) The level of disappointment and shame I feel regarding the incredibly sorry state of affairs in Washington is incredibly high. All of these people are pathetic. The treasury market is still caught between conflicting trends. On one hand, the US is the "least dirty shirt in the hamper," meaning it is still considered a safe haven play in relation to the goings on in Europe. But there are big problems at home, especially as the debt ceiling drama plays out. The latest inflation data is pretty benign, indicating that won't be a reason for a sell-off. However, I'm still concerned that Wall Street has their collective fingers on the sell button. Let's start by taking a look at the longer picture. The IEFs have been rallying since late April. The originally started to rally over concern about the pace of expansion in the US. In addition, fears about the EU situation added to upward pressure during the rally. Prices are clearly about the 200 day EMA, and the shorter EMAs are bullishly aligned. Prices have hit resistance at previously established levels. The longer part of the yield curve has rallied as well, but it is closer to the 200 day EMA. In addition, the shorter EMAs -- are less strong in their orientation. Prices are far from previous highs, and in fact have hit resistance at highs established within the last few months. These two charts tell us the yield curve is still very steep, which tells us a few things. 1.) There is little concern about the Fed raising rates anytime soon. 2.) There is little concern about inflation. 3.) The US Treasury market is still a safe haven in a time of uncertainty. Also note the middle of the curve is near highs established last year. While they could go lower -- that effective yield on the 10 year could conceivably drop to 0% -- this is realistically out of the cards. For the last few months, yields have moved around the 3% level, which seems to be an appropriate return based on all available factors. After approaching previously established highs, prices have fallen back, and are now entangled with the 10 and 20 day EMAs. The 10 and 20 day EMAs have reached previously established levels, with the 10 day now moving lower. As I mentioned above, the 3% interest area seems to be the "center of gravity" right now. Neither market has any firm direction right now and is instead at the mercy of macro economic and political events. There is no trade that I can see right now. But Wall Street is not all that matters. A lot of small businessmen and women out here in what you people in Washington sometimes call "flyover country" are and have for some time been (a) desperately anxious about the shortage of demand, (b) somewhat anxious about instability in the tax code, and (c) slightly anxious about what their health-insurance options will be come 2014. Now they are very anxious about (d) the prospect of what they call "a U.S. government bankruptcy" on August 3, 2011. If the people I talk to are in any sense representative, this added risk that they perceive has been a material drag on the U.S. economy this year and will continue to be a material drag until resolved. 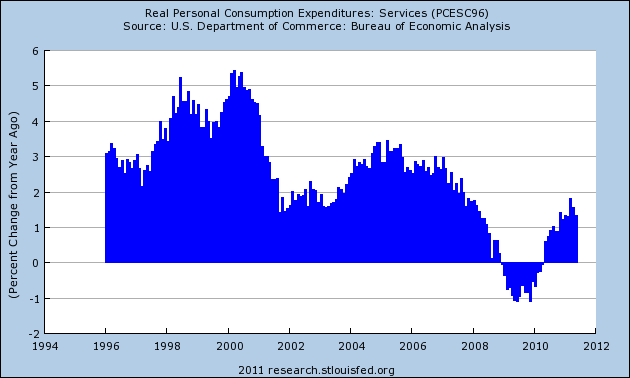 Last week, I noted that PCEs were lower during this expansion than the last two. Today, let's take a more detailed look into PCEs to see where the drop in spending is taking place. The YOY percentage change in durable gods is strikingly strong. While some of the increase is a reaction to the negative reading during the recession, the recent readings indicate consumers are still making purchases in durables in a fairly strong way. The YOY percentage change in non-durables spending is a bit weaker than the last two expansions, but not by much. Spending on services is -- by far -- taking the biggest hit. Services account for about 65% of PCEs -- meaning the drop in service spending is that much more important. Last week was pretty light on economic news. However, we did get some numbers. Consumer spending: there was no news in this area of the economy. Manufacturing: The Philly Fed manufacturing index increased from -7.7 to 3.2 -- a reading of barely positive. The new orders and activity component were also reported at around a reading of "0" indicating a weak overall picture. Housing: Housing starts jumped 14.6%, but the general trend of the housing market is still sideways. We need at least a few more months of data to confirm this is a new trend and not an overreaction from a depressed reading the previous month. Existing home sales decreased .8%, largely because of an unexpected spike in contract cancellations. My reading of this data point is that consumers are becoming increasingly skittish about the economic outlook and are therefore looking to avoid any long-term financial commitment. Finally, the leading economic indicator increased .3. However, the internals were less than inspiring. Save for a big bump in M2 and a wide interest rate spread, the rest of the internal numbers showed a very weak underlying economy. Overall, there was little last week to indicate the economy is coming out of its current soft patch. With all three major ETFs, I'd use the 200 day EMA as a lower support target. I'd place upside resistance for the SPYs at 137, the QQQs at 59 and the IWMs at 86.5 - although I don't expect any of the averages to hit those levels soon. For now, the markets are still waiting out the EU situation and the determination of the US' economic trend. The QQQ's did hit that number and higher -- they closed the week at 59.6. But the SPYs ended the week at 134.5 and the IWMs at at 84. In addition, the transports have yet to rally strongly, taking away important confirmation of the QQQ rally. Prices dropped on Monday, but gapped higher on Tuesday then consolidated on Wednesday. They again gapped higher on Thursday and consolidated gains on Friday. This chart is very encouraging for the bulls, as it shows a strong upward trend. However, the daily chart shows a fair amount of upward resistance from the highs of several weeks ago and those established in early May. While the EMAs are bullishly aligned (the shorter are above the longer and all are moving higher) they have just recently "unbundled" and only recently started to move higher. In addition, the A/D and CMF lines are giving contradictory volume information and the MACD just went positive. 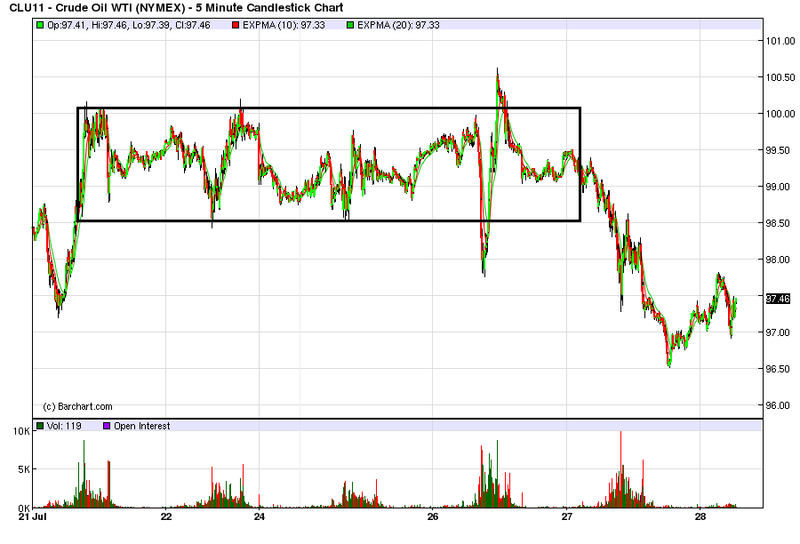 In contrast, the QQQs moved through important resistance levels, but did so on weak volume. But the transports are nowhere near important upside levels to give us any kind of positive reinforcement. The IWMs also have yet to make a new high. Their chart resembles the SPYs with prices being below major points of resistance. There are two ways to look at the current market situation. 1.) The QQQs are making the first advance through important technical territory, to be soon followed by the other averages. 2.) The QQQs are rallying on average specific information, and the lack of confirmation from any of the other averages means the QQQs will be coming back down to a lower level. Given the fundamental economic background, I think number two is by far the more likely analysis of the current situation.